Postage will be added at time of sale. How do we live a mystically-driven life? What does it feel like? Your head tells you want you think is wise to do and your heart tells you what you’d like to do. Your mystical center is in a deeper part of you that tells you what you have to do. Mysticism is being touched and it’s being held and compelled by something that’s deeper than your head, your heart, your feelings, and your imagination. We all have mystical experiences, but we’re not all mystics. Father Rolheiser shares examples of others such as Thomas Merton, Henri Nouwen and Ruth Burrows, OCD as well as some major world religions that benefit from getting in touch with their mystical souls. 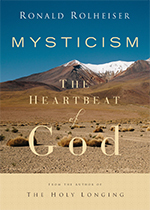 Father Rolheiser shows how living out of mysticism is what frees us up to live true lives, to live noble lives and ultimately to live meaningful lives. 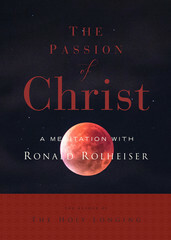 All Ron Rolheiser DVDs are available for purchase on the Franciscan Media website. The toughest missionary task in the world today is communicating the faith to our own children. Secular culture, with its many distractions, has some particular resistances to the Gospel even as it contains much that is moral. Is secular culture post-Christian? How much is our culture a culture of life and how much is it a culture of death? 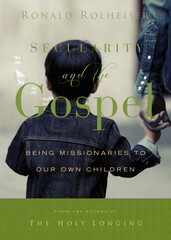 How do we become missionaries inside of secular culture, missionaries to our own children? Growth and discipleship have two distinct parts. We leave home at an early age and spend many years trying to find our way back. How do we get back home again? That’s the spiritual task for the first half of life. 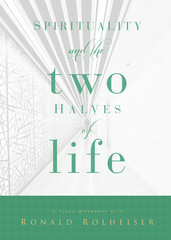 No matter which half of life you’re in, you’ll gain new insights with this program. Leader’s guide included. Approx. 2 hours in 3 parts. Through scripture, and examples of life, Fr. Rolheiser gives new understanding and encouragement in how we can give our lives to the world and to also give our death to the world. When we think of passion, we think of Christ’s physical suffering and death, but in Agony in the Garden, the Gospels do not emphasize Jesus’ physical sufferings. The Gospel writers want us to understand Jesus the Lover who undergoes moral and emotional suffering without resentment or bitterness. Fr. Rolheiser explains that God’s strength comes when we are exhausted and open to being transformed. A profound and moving reflection, in two parts Part 1- 39:23, Part 2 – 49:05. In his insightful presentation on the Paschal Mystery, renowned theologian, Fr. Ron Rolheiser, OMI describes and explains two kinds of death, two kinds of life, and the distinction between “life” and “spirit.” He also investigates what he calls, five distinct moments in the paradigm of the Paschal Mystery. In his clear language and approachable style, Fr. 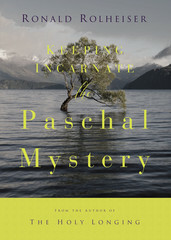 Rolheiser gives us a practical understanding of how the Paschal Mystery plays into our own lives.